Multiple reports claim nearly 5 million Gmail usernames and passwords have been leaked. There’s pandemonium in the streets. Shut off your computer forever. Go off the grid. Luckily, there’s a pretty easy way to check if your account has been compromised. If yours hasn’t been hit, better to be safe than sorry by changing your password now—we don’t want any slip ups in the future. The list of names has apparently been scrubbed from the original source, and Gmail itself apparently wasn’t hacked; there doesn’t seem to be a clear consensus of what is actually going on. 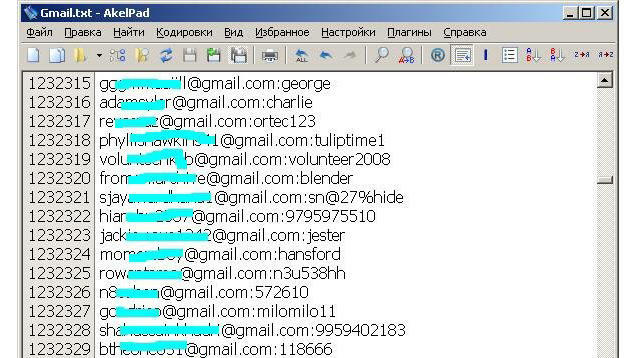 Some reports claim a lot of what has been leaked are from other sites that were simply associated with a Gmail address. There isn’t much clarity at the moment, but seeing as people typically use the same password across multiple sites, it’s important to heed caution. Additionally, many of the reports claim a lot of the information that was stolen is old, so chances are your information is safe. However, Lifehacker notes that other reports are saying that 60-percent of the passwords leaked are still in use—the above screenshot lists about 15 gmail accounts, along with their passwords. Not sure “george,” “charlie,” or “blender” are solid passwords. It’s important to note that Google said Gmail itself wasn’t breached, but it’s still disconcerting to see such a wide-scale leak. To check and see if your information has been compromised, head on over to Isleaked and input your information.